One aspect of the rally in stocks this year that we can’t stress enough is how strong the breadth of the rally has been. Besides the fact that the equal-weighted S&P 500 is outperforming the market cap weighted index by close to three full percentage points YTD, the vast majority of S&P 500 Industry Groups are also either right at or very close to YTD highs. The table below lists S&P 500 Industry Groups that, along with the S&P 500, hit YTD highs so far today. 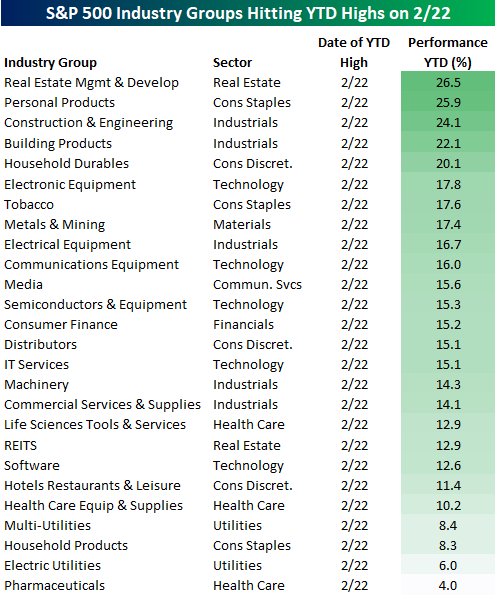 Of the 60 Industry Groups, 26 of them hit YTD highs today and five of them are already up 20% YTD! 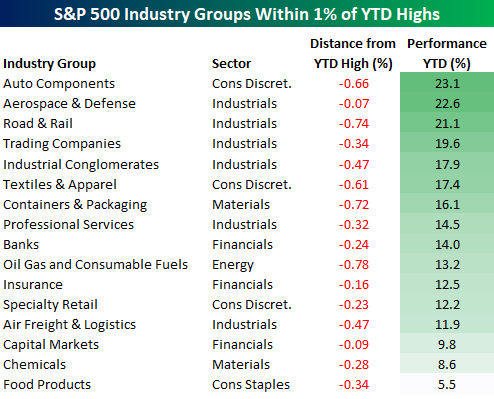 In addition to the 26 Industry Groups above, another 16 Industry Groups traded within 1% of a YTD high today and three of those are also up over 20% YTD. Adding both lists together, 70% of S&P 500 Industry Groups either traded at or came within 1% of hitting a YTD high this morning. That’s broad!